I’ve always wondered how celebrity blogger Perez Hilton throws a pre-Lolla party, so last Thursday we headed to the Hard Rock Hotel to join other fans for a late-night adventure of live rock, pop, dance and hip hop in downtown Chicago. Among other things, it was a night filled with smiling moms, electric grooves and a questionable finale. Editorial Note: This is a special Live Fix enhanced version of an article first published as Concert Review: Perez Hilton’s “One Night In Chicago” on Blogcritics. 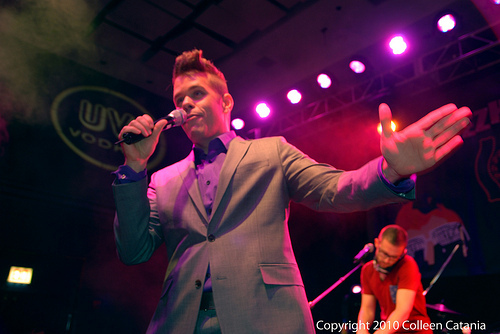 Since 2008, Perez Hilton has hosted his personally curated multi-city concert series “One Night In..” that’s featured such acts as Lady Gaga, N.E.R.D., and Kanye West. And this year’s inaugural stop in Chicago gave us the chance to get primed for Lollapalooza 2010 by taking in sets by B.o.B, Kid Sister, Cool Kid, Nheka, and J Brazil. Adding more mystery and allure to the night, there was a rumor that a “special guest” might make a surprise appearance at the concert. But more on that later. Here’s a quick trip through some of our favorite moments. It was also a family affair as Lissie’s mom was in attendance. She was standing behind me with her camera rolling as her daughter performed on stage. And like the rest of us, her mom had a smile on her face that was a mile wide and filled with pleasure, wonder and pride. I took this video below during her first song while her mom did the same right behind (you’ll see her about two minutes in or so) and it was certainly a magical moment that made me think of our exploration in to the fan-to-artist transformation from a mother-daughter perspective. I didn’t get a chance to talk with Lissie or her mom after the show but I’m hoping to get their thoughts and share them with you, so I’ll keep you updated. Next up was Melissa Young (aka Kid Sister). The southside Chicago-native bolted on stage and flew through tracks from her debut album Ultraviolet . Among other electrified dance moves inspired by her love for dance club culture, Young dropped low to the ground and put on a dazzling boogie clinic during the irresistible and turbulent “Switch Board.” Like a speed-juking queen her hips and thighs moved like lightning to percussive electro-bongos blasting from the speakers. Back in November at the House of Blues, I saw Young do the same thing and bring up fans on stage to dance and it was great this time to be able to capture such a prime moment that I considered an ultimate expression of the Community of Groove. This video below is the first in an upcoming Live Fix Experiment where I’ll break down B.o.B’s performance of “Airplanes” in to the three elements that made the collective vibe of the set so powerful, memorable and engaging. So for now, please enjoy this first video that captures the dramatic swelling intro. So with the Red Bull-high wearing off and the DJ spinning his final song, we walked out of the Hard Rock and headed home thinking how lame the finale was. I’m pretty sure Hilton is a big live music fan, so it was surprising that he would choose to end a show like that, especially the first night of the 2010 “One Night In…” showcase. But no bad feelings here. Aside from not delivering the rumored “special guest” and not saying goodbye on stage to fans once the show was over, for the most part, Hilton put on a fun night of live music and the show served its most basic purpose, which was to get us ready to rock Day One of Lollapalooza. So in the mean time check out more of Colleen’s photos and stay tuned for our full Lollapalooza review that’s coming up reeeeeal soon…. Were you at One Night in Chicago? Tell your story and let us know about some of your favorite experiences in the comments below. See how other fans have told their story in these exclusive Live Fix fan interviews .